An above average, capable, well-priced sub compact espresso maker that is held back somewhat by a primitive interface and control system. 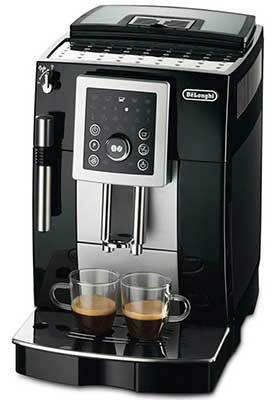 Recommended for: Singles, small households, casual coffee drinkers, purists who are looking for a bit of automation. Do you live alone, or in a small household? Are you in the market for a robust espresso machine, offered at a great price that will give you all the tools you need to make just about any specialty coffee drink you can imagine while offering up some basic convenience features? If so, then you’re going to like what we have to say in our detailed Delonghi ECAM23210SB review. It’s a good machine by most accounts, but it’s not without its flaws. Not only were certain sacrifices made to keep the cost of the unit low, but the designers made some perplexing decisions when selecting components for the machine that weaken the design, which may prove to be deal breaking for some. Not to worry, we’ll cover everything this machine can and can’t do in the sections that follow so you will have all the info you need, at your fingertips, to decide whether or not it’s a good fit for you. That said, let’s jump right in and see what it can do! The first thing you’ll notice about the ECAM23210SB is its smallish footprint. Measuring 16.9” x 9.4” x 13.3,” it’s not likely that you’ll have any trouble finding a permanent home for the machine, even if counter space in your kitchen is at a premium. If you do find yourself having to move it around though, that’s also not much trouble, given that the machine only weighs twenty pounds. 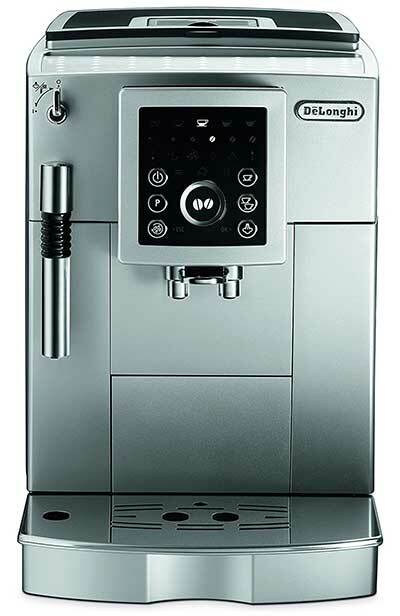 While the machine was designed in Europe, it’s one of the few Delonghi machines manufactured in China. That’s probably not going to be a deal breaker for anyone, but it’s worth mentioning and is another move the company made to help keep the cost of the machine relatively low. It’s made of sturdy, blue/silver-hued ABS plastic, with a few metal and black accents, which explains why the machine is so light. Obviously, solid stainless steel construction would be superior and give heft and durability to the device, but again, the point of the machine is to offer a small, value-priced unit, and heavy use of stainless steel would have dramatically increased the price. It's a fairly stylish machine, with unmistakable European styling, and should be a good fit into most home kitchens. We drink a lot of coffee, so for us, there’s no such thing as a tank that’s too big. In this case, we were pleasantly surprised. Despite its diminutive size, the Delonghi ECAM23210SB boasts an impressive 60-ounce, side-loading water tank. This tank is designed to accept a filter, and if you use one, you’ll dramatically reduce your need to descale the machine. On the other hand, filters are expensive, and you’ll spend about $25 a month if you opt to use them, which, over time, will dramatically increase your total cost of ownership of the machine. Ultimately, it comes down to figuring out what’s more important to you: Decreased maintenance, or lower total cost of ownership. There’s no right answer to that question, so it just depends on which is a better fit for you and your lifestyle. If you opt not to use the filter, you can still reduce the need for descaling if you use distilled water in the tank, or if you’ve already got a water filter hooked up to your kitchen sink. Both are viable alternatives to using the tank filter. Pro Tip: You’ll need to manually tell the machine if you install a water filter. If you don’t, then it will still bug you about descaling when you don’t actually need to, so don’t forget! There are some aspects of this feature implementation that we like, some we don’t, and some we’re mystified by. This is one of those aspects of the design we were talking about in the introduction. On the plus side, the grinder has thirteen grind settings, which is fantastic. The more grind settings you have available, the more control you have over the taste of the drinks you make, because small changes to your grind can have big flavor impacts! First, adjusting the grind is as simple as turning the knob, located on top of the unit, inside the bean hopper. No special tools required! Second, the number of grind settings listed on the dial that surrounds the knob is seven, but this is misleading because you can make half-step changes, for a total of thirteen different settings. Finally, the industry average is six grind settings, so this is significantly above average! As good as this part of the implementation is, there are two problems. One medium-sized, and one fairly large. 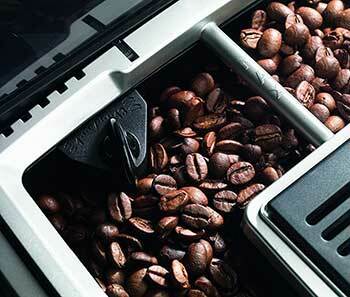 The smaller of the two issues is that the machine uses a stainless-steel, conical burr grinder. We’d have preferred to see ceramic here because stainless-steel grinders can overheat, which will burn your grounds and ruin the flavor of whatever drink you’re trying to make. The larger issue is the bean hopper. It’s quite small, holding just 5.5 ounces. This is not well-paired with the size of the water tank, which means that you’re going to find yourself having to stop what you’re doing to refill one or the other. That doesn’t happen when the two are well-matched in terms of size, so we’d have preferred to say an 8-10-ounce hopper capacity. From a design standpoint, it’s hard to see why this decision was made. If you’re designing a model for casual coffee drinkers, the small bean hopper works, but then you don’t need a sixty-ounce tank. If you’re designing it for power coffee drinkers, then the sixty-ounce tank is a welcome sight, but the bean hopper is annoying. There’s just no good reason for the decision that we can see. The ECAM23210SB utilizes a single aluminum boiler, lined with stainless-steel. We prefer double boiler systems that allow you to simultaneously steam milk and pull shots, but we completely understand why this design decision was made. It’s virtually impossible to find a value-priced machine with two boilers. The main benefit of a double boiler system is one of speed – it simply takes less time to prepare milk-based drinks. DeLonghi has taken pains to minimize your wait time on this unit by incorporating Thermoblock technology into the boiler, which allows it to shift temperature rapidly when switching from one task to the other. Specialty coffee drinks were meant to be enjoyed at temperatures somewhat lower than most Americans like their coffee. With that in mind, especially if you’re making a milk-based drink, you’ll probably want to gravitate to the highest boiler temp setting and work your way down from there. This is a nice convenience feature that can influence the amount and quality of crema in your cup. For best results, always adjust the coffee spouts so that they’re just above the lip of whatever cup you’re using. 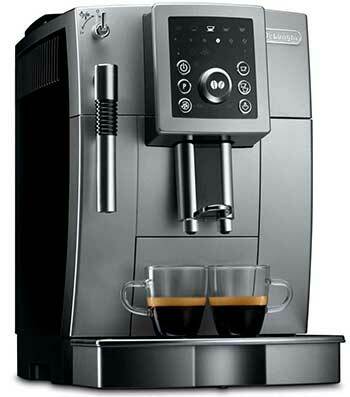 The ECAM23210SB’s spouts will adjust to accommodate a maximum cup height of 5.5”. That’s probably not quite enough room for your favorite super-sized coffee mug to fit beneath it, but it’s a broader range than many more expensive machines offer, so we count it as a win, and a strong feature implementation. 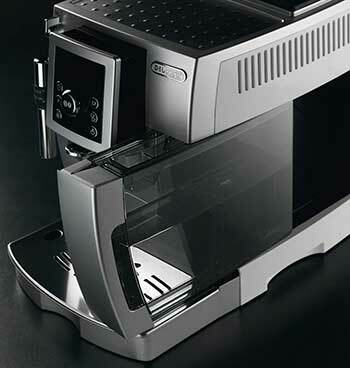 This is the heart and soul of every espresso machine, and the Delonghi ECAM23210SB is no exception. 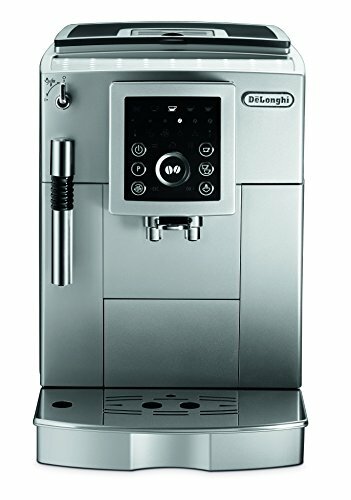 There’s not much to say about the brew unit, except to note that as with most Delonghi models, it is removable, which means you don’t have to worry about cleansing tabs. Just pop it out about once a week as part of your routine maintenance, give it a good rinse, let it dry, and put it back into position. That’s all there is to it! Where the control system is concerned, we have issues. It’s fairly simple, and won’t take you much time to master the machine, but it could be made even easier. As things stand, what makes it easy to use is the fact that it has a limited feature set. When you first get the machine, you’re likely to feel as though the control interface is actively working against you. This is because rather than using a TFT (Thin Film Transistor) or LCD screen, it uses old school LEDs and somewhat cryptic lights. Once you work out what the various lights (the manual will be a big help in this regard), it’s not that hard to use, but with a better display and navigation system, the unit would have no real learning curve at all. The machine also tracks basic statistics for you, so you can keep track of how many coffees you’ve brewed, but again, interpreting the results in the absence of a modern display screen is a bit harder than it needs to be. What’s worse is the fact that adding a modern display to the unit would not significantly increase its price. In our view, this is the biggest weakness of the design, and it would be incredibly easy to fix! 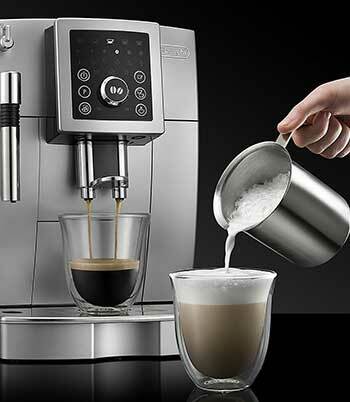 Another important part of the system is the unit’s brew pump, but before we can get into that, we should explain the key difference between drip brew coffee and espresso in this section of our Delonghi ECAM23210sb review. Unlike drip brew, which relies on gravity to get the coffee from the machine to your cup, espresso machines rely on pressure for brewing, and pressure is measured in bars, where one bar is equal to atmospheric pressure at sea level. It takes nine bars of pressure to make a great espresso, and the ECAM23210SB’s pump is rated at fifteen bars, which means you’ll have all the pressure you’ll need to make a world class shot of espresso, every time you use the machine. Broadly speaking, there are two ways espresso machines can handle the milk frothing function. Either via a steam wand or an auto-frother. Newbies tend to prefer the auto-frother approach because it automates the process and doesn’t require any special skill to use. Connect the milk source to the machine, push the button, and wait. Coffee purists, on the other hand, prefer the steam wand, because it gives them a high degree of control over not just the temperature of the milk, but also the quantity and quality of the foam. The Delonghi ECAM23210SB utilizes a steam wand, but if you’re new to the world of specialty coffee, don’t let that intimidate you! While it’s true that learning to use the wand will take a bit of time and practice, it’s not that difficult to get right, and after your third or fourth drink, you’ll be producing consistently good results! There are two things to say about this. First is that yes, the ECAM23210SB has one, and second, it’s sadly not very good. The cup warming tray is passively heated, but for some reason, this one takes a long time to get warm enough to make a difference. You’ve got to leave it on for the better part of an hour before it’ll start to have an impact. That’s unfortunate, because brewing drinks into a cold cup will cause you to lose heat, and lower the overall temperature of whatever drink you’re making, and you’ll notice the difference most keenly in milk-based drinks. Unfortunately, given the relative weakness here, your best bet is to fill your cup with water and nuke it for a few minutes to get it heated, then brew your drink. We’ve already complained about the weakness of this model’s interface and control system, so we won’t bore you by rehashing all that. Suffice it to say that this machine is made easier to use by virtue of the fact that it doesn’t have a lot of features, to begin with (though it’s got the basics covered, and gives you all the tools you need to make your favorite specialty coffee creations), but made more difficult to use, thanks to its outdated control system. That’s it, in a nutshell. If you keep up with those things, you’ll be in good shape. On balance, we like the Delonghi ECAM23210SB, but as you can see, there are some issues with some of its features. Are any of those things deal breakers? Probably not, so at the end of the day, we judge that this model has more positives than negatives. And that brings us to the end of our Delonghi ECAM23210SB review. It’s not a perfect machine, and it’s not for everyone. If you live in a large household with several coffee drinkers, this one will be completely overwhelmed and probably not up to the task. In fact, it may be overwhelmed by just one person, if he or she is a power drinker. On the other hand, if you don’t drink a ton of coffee, live alone, or are the only coffee drinker under your roof, and don’t have a lot of space to work with, this model provides a lot of value for the money and would be a strong choice. On that basis, we provisionally recommend it. Is Your Coffee Too Fresh? Clive Coffee. How Long Is Brewed Coffee Good For? Home Grounds. 4 Quick Ways to Maintain Your Coffee Grinder. Serious Eats.